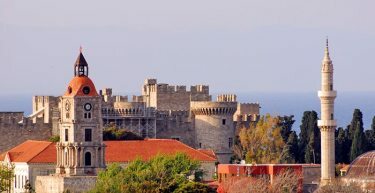 Rhodes is the largest island in the Dodecanese. The capital city, located at its northern tip, is the capital of the Prefecture with the Medieval Town in its centre. In 1988, the Old Town has been designated by UNESCO as a World Cultural Heritage. As you enter through the Gate of Freedom, the amazing buildings, the walls, old houses, narrow alleys, fountains, make it feel like you have stepped back into medieval times and you are in a living museum. The Palace of the Grand Master is certainly the highlight of the Old Town. The Palace built at the end of the 7th century A.D. and now it has been converted into a museum. A stroll in the cobblestone Street of the Knights is an experience not to be missed. At the end of the street, in the Museum Square, is the Archaeological Museum. The Old City is one of the few inhabited medieval cities in the world. Here, the visitor may find shopping, restaurants, cafeterias and very interesting nightlife. Outside the walls of the Medieval Town is the “new” city, with its beautiful Venetian, neoclassic buildings, such as, the Church of the Annunciation , Justice Palace, Post Office, Town Hall and the National Theatre. All motor vehicles are prohibited from the entrance to Old Town, taxes excluded.